Playback tests were conducted to determine whether black-capped chickadee (Parus atricapillus) flocks recognize the difference between their own calls and those of another flock. The ‘chick-a-dee’ call of the species includes flock-specific acoustic differences that arise, in part, from vocal convergence among flock-members. 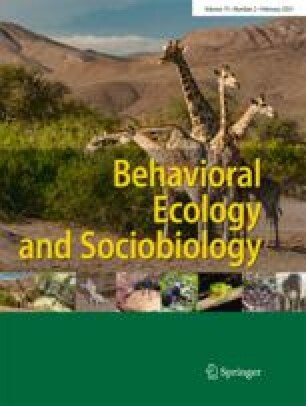 The call is used in behavioral contexts such as flock territory defense and predator ‘mobbing’, suggesting its importance in coordinating flock behavior. The results show significant differences between responses to foreign and resident calls. Test flocks responded to foreign calls by increasing their own calling rate and decreasing their foraging rate at a feeder set up above the playback speaker. Test flocks' responses to their own calls did not differ significantly from baseline levels of behavior. The significance of flock recognition based on an acoustic signal is discussed.